This was a fifth grade laptop classroom today. We were doing the very beginning lesson of Garage Band, and how to mix voice and mix music. This was their very first attempt at doing a podcast. Podcasting is kind of bringing it all together, it’s a project based learning type. It starts with vocabulary and then I have the very clear directions with pictures, and then you don’t just use technology for technology sake, you bring in the subjects. In this case we were bringing in reading and writing, and they’re going to do their first podcast on science. They’ve done invention convention, and they’re going to have that explanation of what their invention is, and they’re going to have their computer there with their podcast so that everybody can listen to what they’re explaining, their invention. You’re bringing voice, and video, and images, and sound, and music all together to further your learning. Whether it’s in language arts or reading, or math, or science, or social studies. They’re going to be made into a webpage that will be on the school webpage so that the parents and grandparents, and aunts and uncles, you know it’s real easy to send somebody a URL and say, “Suzy did a podcast on her story today, or her invention today.” So that fathers, if they’re not right there, they can access the internet, the school homepage, and then they can hear and see the work, so it’s a different kind of publishing. Use Garage Band software to record presentation on their invention. Share information on their invention through a podcast. Students had previously created their own inventions and participated in an invention convention. 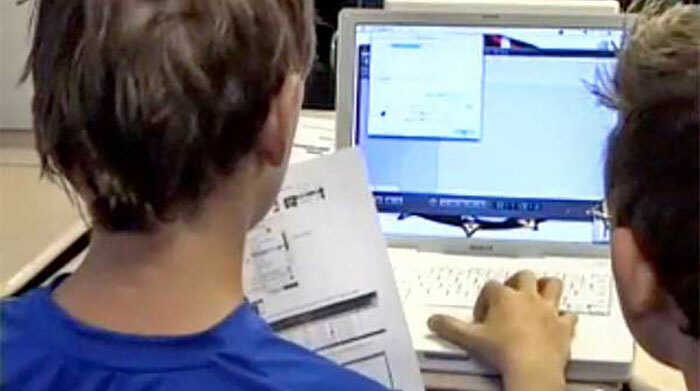 Students will use Garage Band to record themselves sharing information on their inventions. Students then create a podcast that will ultimately be uploaded to the school website for open access.